If you want to grab a FREE copy of my cozy mystery, Death Twitch, here is your opportunity! For a short time only, it is available FREE, July 20 – 24, as a promotion on Amazon. A fun light hearted mystery that will make you smile and keep you guessing. This is the debut novel featuring the Mad Professor and the Adventure Doctor. Two amateur sleuths who have joined the ranks of Australia’s “grey nomads” and travel around Australia in a snazzy caravan. They happen to get into all sorts of murky situations which requires them to solve some pretty wicked mysteries. Why not try a cozy mystery? Death Twitch: a murder mystery with a sense of humour! A birdwatching tour in Australia’s Outback turns deadly. Did the birds do it or was it all just a big cultural misunderstanding? Available on Amazon as an ebook. Just follow the links below. Comments Off on Love a good mystery? The Great Southern Centre for Outdoor Recreation Excellence (GSCORE) has been launched! Adventure opportunities in the Great Southern will be taken to a new level with GSCORE. When you think adventure, think the Great Southern. The Great Southern region of Western Australia is blessed with a natural environment bursting with opportunities to climb, hike, walk, cycle, paddle or sail. GSCORE will position the Great Southern as a hub for outdoor recreation education and active leadership, driving education visitation and job creation in the training sector, including the growth and expansion of the tertiary sector and creative partnerships with the tourism and commercial sector. We know it has been a while since our last blog post but never fear, the adventure doctors are back! We have been busy getting ready for our great adventure around Australia. Our adventure and touring kit is almost ready and we will be heading off to visit and explore as many national parks around Australia as is humanly possible. Join us on our quest as we explore this amazing country and what it has to offer. We will show you how you can also live the great Australian dream with lots of helpful tips and information along the way, places to visit and things to see and do. Tip 1: Dare to dream and then live the dream. Attitude is everything. Tip 2: Spend more time living your dream then dreaming about it. Make it happen. No excuses. Work out what you need and what you don’t need. Less is better. Tip 3: Have a plan and don’t be afraid to modify things as circumstances change. Tip 4: Do not fear new ideas or change, learn as you go, take more calculated risks in life. Meet new and interesting people. Extend your social network. Tip 5: Keep an open mind, opportunities exist where you find them. Tip 6: Life is what you make it, a little bit of luck helps but the rest is up to you. Tip 7: Do your numbers, a budget helps. Tip 8: Try and think differently about everything in life. Gold and a chair fit for the occasion! 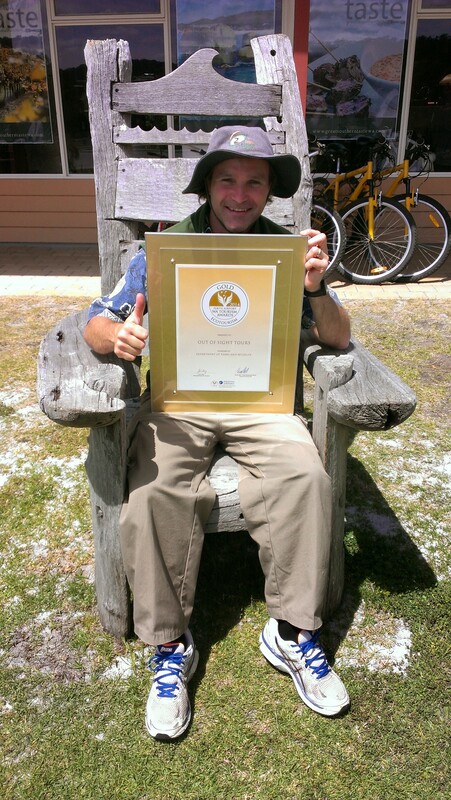 It gives me great pleasure to announce that we have been awarded the Gold Medal for Ecotourism at the Western Australian Tourism Awards for the third year in a row! It all comes down to having a fantastic team at Out of Sight Tours who are passionate about what we do and driven to achieve great things. Also, a big thank you to all our past customers, fans, fellow bloggers and supporters. We could not have done it without you. As a result of winning the award for three years in a row we will be inducted into the Hall of Fame in 2015. What an honour!!! More great news … Out of Sight Tours has won the silver medal in ecotourism at the Australian National tourism awards ceremony! Talk about going out on a high … yes, we have also sold the business!! Our success can be summed up in the following – strive to achieve great things, never give up on your dreams and have fun doing it! Comments Off on Gold and a chair fit for the occasion! WIN a free eco adventure day tour run by multi-award winning Out of Sight Tours to West Cape Howe for you and a friend or partner valued at $300!! Enter now for your chance to WIN!! See the instructions below. How to enter instructions: All you need to do is submit a reply to this post in the contact form section below, in 150 words or less, tell us why you would like to go on an eco adventure tour to West Cape Howe with Dr Dave. Prize description: The winner will receive an eco adventure day tour run by Western Australia’s multi-award winning ecotourism operator Out of Sight Tours to West Cape Howe for themselves and a friend or partner valued at $300. West Cape Howe National Park is the most southern point in Western Australia halfway between the towns of Denmark and Albany. You will be taking a trip on the wild side to see the ancient dolerite cliffs of Gondwana. The stunning rugged scenery of West Cape Howe National Park is mesmerizing. You’ll be transfixed by the amazing beauty of this remote and inaccessible location. Your tour will take you on an awesome off-road journey to a place that few people will ever see. Your experienced guide will be none other than Dr Dave himself, also known as the Adventure Doctor, who is a WA FACET Golden Guide winner. He will take you along a 4WD-only track to see the amazing dolerite coastal cliffs, peaceful beaches, and hideaway bays. The tour will depart from the Denmark Visitor Centre at 10am and return at 3pm. It includes a delicious lunch, homemade muffins/cake and plunger coffee or tea options!! Winner announced: The best reply will be chosen by the judging team from Out of Sight Tours and the winner announced on November 4, 2015 (AWST) on this blog site. The judges reserve all rights in the selection of the best entry. Winner is: Juliet Zarr. Congratulations! Contest rules and prize details: You must be at least 18 years of age and an Australian resident. Accommodation & travel to Denmark, Western Australia, is at your own expense. The prize is valid for 3 months from the day the winner is announced. No purchase is necessary to enter. By entering a reply you are agreeing to the rules of the contest, see the full terms and conditions below. Hints & tips: 1. You can make more than one reply. A maximum of 3 replies are allowed per person. Entries by the same person under multiple profiles or accounts are not allowed. 2. You can include a link to your blog, website, YouTube, Google+ or other social media. 3. Don’t forget to follow the adventure doctor blog. 4. Share with friends – this gives you more opportunity to win. 5. Have fun! Please read below for full terms and conditions. 1. By submitting an entry, also referred to as a reply or email, you shall be deemed to have accepted the following terms and conditions. 2. Entries which do not fulfill the criteria will be rejected. For the purposes of the competition, an “entrant” is defined broadly to include a person who posts a reply. Entrants must meet the following eligibility criteria: a. entry is open only to legal residents of Australia who are at least eighteen (18) years old at the time of entry b. entries will not be accepted from Out of Sight Tours employees, immediate family or partners. The winning entrant will require good physical and mental health to undertake the activity on offer. 3. To enter the competition, you must submit your entry written in English. 4. The competition opens at August 28, 2014 AWST and closes at 17.00 (AWST) on November 1, 2014. Any entries received after the closing time including delayed or misdirected entries, or entries which are not received due to server function or technical difficulties, will not be accepted. 5.a. Entrants may submit a maximum of three (3) entries to be eligible. b.Entries by the same person under multiple profiles or accounts are not allowed. 6. Selection of the winner will be by a panel of judges from Out of Sight Tours. Selection of a winner will be based upon originality and creativity of an entry. The panel’s decision is final and no correspondence will be entered into concerning the selection process. 7. The winner will be contacted by email at the contact information provided with the entry within 14 business days of the competition close by Out of Sight Tours. 8. The winner must confirm their acceptance of the prize in writing to Out of Sight Tours within 7 business days of notification or the judging panel may review entries and may choose an alternative winner. The Sponsors are not responsible for any incorrect or illegible address information or the non-delivery of any prize, or for any unsuccessful efforts to notify a winner. It is the sole responsibility of the entrant to notify the Sponsors by email if the entrant changes his/her email address. 9. The prize must be taken in full by March 2015 however this is subject to change at Out of Sight Tours discretion depending on availability of tours. 10. The prize is a tour to West Cape Howe for two people and includes lunch, homemade muffins/cake and tea or coffee. 11. The prize is not transferable or exchangeable or redeemable for cash. 12. All accommodation, travel and personal expenses shall be the responsibility of the individual, unless expressly specified. 13. The winning entrant agrees to participate in Out of Sight Tours promotional activities such as media interviews, photographs as deemed necessary. a. your entry material and content is and will be an original work. b. All material submitted is accompanied with appropriate licenses, permissions and clearances enabling Out of Sight Tours to publish, broadcast, communicate and distribute the content in all media formats. c. you own and control all of the rights to any content you may use either for the entry or you otherwise have the lawful right to distribute such content. d. your content is accurate and not misleading. e. any content you submit does not contain any obscene, defamatory, inappropriate or unlawful material. f. the use and posting or other transmission of the content will not violate the rights of any person or entity. g. You agree to indemnify Out of Sight Tours for any breach of these warranties. 15. You agree to grant Out of Sight Tours an exclusive perpetual license without cost to use your entry content for promotional purposes through Out of Sight Tours online assets, for example, but not limited to, using it on blog, Twitter, website. b. This promotion is in no way sponsored, endorsed or administered or associated with, Facebook. 16. Out of Sight Tours takes no responsibility and assumes no liability for any content posted, stored or uploaded on your blog sites, nor is Out of Sight Tours liable for any mistakes, defamation, omissions, falsehoods, or obscenity in relation to the content. 17. By entering this competition, you subscribe to receive online updates and communications from Out of Sight Tours concerning the competition and thereafter to receive other online communications from Out of Sight Tours. 18. All entrants agree to release and indemnify Out of Sight Tours against all liability, cost, loss or expense arising out of their involvement in the competition including (but not limited to) personal injury and damage to property and whether direct or consequential, foreseeable, due to some negligent act or omission or otherwise. 19. Out of Sight Tours reserves the right to change or modify any of these terms and conditions at any time. 20. The Sponsor of the prize is Out of Sight Tours. 21. Limits of Liability: Entrant acknowledges and agrees that the Sponsor has no responsibility whatsoever for injuries, losses, or damages of any kind that result from entrance into the Contest or receipt, acceptance, possession, or use of any prize. Contest Sponsor assume no liability for lost or misdirected entry forms regardless of the circumstances. The Sponsor shall not be liable for any injury, damage, loss, expense, accident, delay, inconvenience, or other irregularity that may be caused or contributed to (1) by wrongful, negligent, or unauthorized act or omission on the part of the Sponsor or any of their agents, servants, employees, or independent contractors, (2) by any defect in or failure of any vehicle, equipment, instrumentality, service, product, or accommodation that is owned, operated, furnished, or otherwise used by the Sponsor, (3) by the wrongful, negligent, or unauthorized act or omission on the part of any other person or entity not an employee of the Sponsor or (4) by any cause, condition, or event whatsoever beyond the control of the Sponsor. 22. The Sponsor reserves the right to cancel the Competition at any time if the integrity of the Competition is, in the Sponsor’s sole and absolute discretion, compromised in any way. By entering the Contest, entrants release and hold the Sponsor harmless from and against any and all damages and claims of any kind in connection with the Competition or resulting from entrance in the Competition, or receipt, acceptance, possession or use of the prize. The Sponsor reserves the right to substitute a prize for an alternative prize of equal or greater value is at the Sponsor’s sole and absolute discretion. Wow … what a journey it has been. Even Lionel Messi will need a holiday now that The World Cup drama in Brazil has finished. You too can start making plans to visit The Great South West Edge on your next holiday to Australia and discover the biodiversity difference. See where the forest meets the sea. Get inspired and get going. Open the door to your new life and live the life you have always dreamed of, dare to dream and then live the dream. Experience it yourself. Do you want to go now? See the video and fly like an eagle. An adventure that just keeps on giving you more. Wash away your stress, have fun and stay young in The Great South West Edge. Don’t miss this ecotourism hotspot next time your in the wild west, Western Australia. Be smart and go with the best. About the author: David Bomba, founder & director, a leader in ecotourism @OutofSightTours. He specialises in tour guiding, adventure, innovation and social media. You can also follow Dave’s travel adventures on Google+ and Twitter. What is The Great South West Edge? A sneak preview – fun & adventure in WA! Stay tuned for a fun series about the South West of Western Australia featuring Dr Dave. Stars Alex James and Matt Stone peek over the edge of West Cape Howe in an episode not to be missed! Recipes that Rock Part 2 – The Great Southern – The new series is on-air from May 16 (in Australia) on Channel 628 on Foxtel, Nat Geo People – National Geographic Channel AU. Lots of good food, fun and adventure, click here for a sneak preview! Comments Off on A sneak preview – fun & adventure in WA! Blow my mind, I’m just wrapped to be part of helping people to live the dream! been accepted, so Denmark will now be a part of our lives into the future. have a 4×4, and we don’t have the firsthand experience that you have. beautiful insight into this unique region. corralled by a school of very large sharks. I revisited this classic piece on Gondwana, an oldie but a goodie, just in time for the coming winter, as the swell builds the waves are coming. There will be high drama at West Cape Howe yet again!